That's the considered opinion of Carl Anderson, recently retired McGill professor of religion. Lonely, aimless, embittered by his children, unable to derive significance from his long career, irked by the “putter-putter” ﻿meaninglessness o﻿f existence at the seniors residence he has been shipped off to, and both cursed and blessed with an infallible memory, Carl is spooked by the inevitability of impending weakness, illness, and death. He is also haunted by childhood trauma, the source of which, imagined or real, is beyond his power to access. Carl befriends Shelley Randell, bookworm extraordinaire. An orphan, she is Westmount Library's goth librarian. Shelley has been HIV-positive since birth. As she is also 56 years younger than Carl, it's only natural that they become friends. Carl hires Shelley to accompany him to Liberal, Kansas, where they uncover Carl's childhood history. The adventure doesn't go smoothly, however. They commit two crimes, and the first symptoms of Shelley's life-threatening illness appear. After returning to Montreal Shelley refuses treatment, driving Carl crazy. His attempts to keep her alive become increasingly extreme. They jeopardize his financial security, his son's wellbeing, and, eventually, his own life. 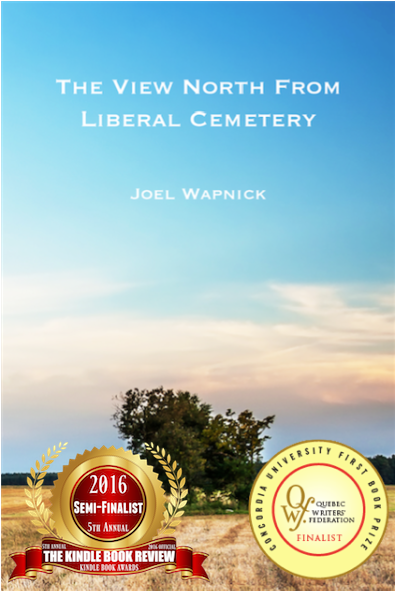 Excerpts from The View North From Liberal Cemetery can be found here. "The result, told in a meticulously pitched seriocomic voice, is part cross-generation love story (think Harold and Maude, very roughly), part meditation on infirmities both physical and emotional, part study in atonement and redemption."